The relic was discovered missing early on the morning of Jan. 26, when a church custodian found a broken window at the Church of San Pietro della Ienca in the mountainous region of Abruzzo. She called the police, who discovered that the reliquary was missing, along with a small, simple cross. Three men were arrested in connection with the relic’s theft. According to Reuters, the cloth was found in the garage of two of the men, and was pieced back together. The fabric is still missing a few cloth filaments and a gold thread, the bishop said. The piece of cloth, stained with John Paul's blood, was discovered on Friday in a garage belonging to two men, police told reporters this afternoon. Bishop Giovanni D'Ercole, auxiliary bishop of L'Aquila, told a news conference he had pieced together the reliquary and the cloth after police found them in pieces on successive days. He said the recovered piece of fabric was missing just a few filaments of cloth and gold thread, and that police were continuing to look for the rest of the relic together with a 'Scientific Task Force'. Yesterday morning, they apprehended three drug addicts in their late teens who had a history of petty theft but said they didn't realize the value of what they had stolen. Many were mystified by the robbery as no money was stolen, leading some to speculate possible satanic motives. The previous day, the thieves turned over an empty iron reliquary, along with a stolen cross, buried on the grounds of a drug treatment facility in the city of L'Aquila, about 75 miles east of Rome. They said they had removed and discarded the relic itself because they considered it worthless. "These three lads have the forgiveness of Pope John Paul II and our own," Bishop D'Ercole told reporters. WARSAW, Poland -- Pope John Paul II's secretary "did not have the courage" to burn all of the pontiff's notes after his death, and is now having some of them published, he said Wednesday. The book, "Very Much in God's Hands. Personal Notes 1962-2003," comes out Feb. 5 in Poland, where the pope is still a much-loved authority. It contains religious meditations that Karol Wojtyla recorded between July 1962, when he was a bishop in Poland, and March 2003, when he was pope. Cardinal Stanislaw Dziwisz told a news conference that in preserving some of the notes he was motivated by the "despair of historians" when the letters of Pope Pius XII were burned after his death, as he had wished. In his last will, John Paul commissioned Dziwisz, his personal secretary and closest aide of almost 40 years, to burn his personal notes. Instead, Dziwisz kept them and is having them published before John Paul is declared a saint April 27 in Rome. They were made available to the Vatican in the pope's fast-track beatification and sainthood processes. grace-land, I have real mixed feelings about this -- to go against the will of his friend and his Pope . . . I just don't know. I have mixed feelings about it, too, Sister; but I'm leaning toward burning the notes. However, I can understand his sincere explanation to publish the notes--having read and reflected on the information in the two articles. It must have been a very difficult decision to make in my opinion. Yes, I am leaning toward burning the notes. That was his promise! "[In this Book] you will discover many unpublished stories and anecdotes; you will have the possibility to know the great heart with which Karol Wojtyla loved God and humanity." Below is the Introduction to the book “Beside John Paul II – His Friends and Collaborators Speak”. With this book I seek to have Karol Wojtyla known, the man and the Pontiff, recounted in twenty interviews by persons who served him, who were at his side, who helped him to write the history of the Church and of the world. In twenty-seven years John Paul II made 146 apostolic journeys in Italy and 104 abroad, visiting 129 countries: 822 days travelling; in the 147 ceremonies of Beatification he proclaimed Blessed 1338 Servants of God and in the 51 ceremonies of Canonization he proclaimed 482 Saints. He wrote 14 Encyclicals, 15 Apostolic Exhortations, 11 Constitutions, 45 Apostolic Letters, to which are added the annual Messages for the World Day of Peace, the World Day of the Sick, the World Youth Day, and the World Day of Social Communications. In twenty-seven years the Polish Pope changed the world: he did so not thanks to sophisticated political strategies but, above all, because he succeeded in touching and changing people’s heart. True and lasting changes are not possible if they are not born in persons’ hearts. In the book you are about to read the persons I interviewed talk about their meeting with Pope Wojtyla, in joy and in suffering, in doubt and in certainty, in health and in sickness. You will discover many unpublished stories and anecdotes; you will have the possibility to know the great heart with which Karol Wojtyla loved God and humanity. Vatican City, Mar 11, 2014 / 06:09 am (CNA/EWTN News).- The personal notes of JPII published by former secretary Cardinal Stanislaw Dziwisz, which the pontiff asked to be burned, reveal the depth of the Blessed's keen knowledge of the mystery of the Trinity. Entitled “I am so much in God’s hands: Personal records 1962-2003,” the book was published by Krakow-based publisher Znak on Feb. 12, and contains 639 pages of meditations and some photos and scans of the pages from two of the late Pope's notebooks, one beginning in 1962 and the other in 1985, which were both published in Italy by the Archdiocese of Milan. Coming from one of the notebooks, the pontiff writes on the identity of the Trinity in three separate meditations, one focusing on God the Father, one on the Son, and another on the Holy Spirit. Vatican City, Mar 12, 2014 / 06:02 am (CNA/EWTN News).- In private letters of Bl. John Paul II which have been published by his former secretary, Cardinal Stanislaw Dziwisz, the pontiff reflects on the three theological virtues, emphasizing that Mary is the highest example of each. “Nothing can be dangerous for us; neither Satan nor the world, nor sin – if there is in us the power of Christ in the Marian way,” Bl. John Paul II wrote in one of his personal notes. Entitled “I am so much in God’s hands: Personal records 1962-2003,” the book containing the Pope’s letters was published by Krakow-based publisher Znak on Feb. 12, and contains 639 pages of meditations and some photos and scans of the pages from two of his notebooks, one beginning in 1962 and the other in 1985, which were both published in Italy by the Archdiocese of Milan. Reflecting on the virtues of faith, hope and love, the blessed expressed his thoughts regarding their nature, observing how each is brought to full fruition in the life and example of the Mother of God. Pope John Paul II. Photo: wikipedia Karol Wojtyla: The True Story begins with a depiction of the assassination attempt on the pope on St. Peter's Square on 13 May 1981. However, the two-hour production will mainly deal with the future pontiff's rise to prominence in his native Poland. “This is the story of the young Karol, his feelings, the war, his mother Emilia, his soldier father and his brother Edmund who he had to part with when he became a doctor,” revealed director Duccio Forzano. The score has been written by Noa, an Israeli pop star who knew the late pontiff. Noa sang a rendition of Ave Maria for the pope in 1994. (CNN) -- The gun used in an assassination attempt on Pope John Paul II is to be displayed in the late pontiff's childhood home in Poland, ahead of his expected canonization next month. Italy's Justice Ministry has loaned the weapon, a Browning 9mm, to the John Paul II Museum in his hometown, Wadowice, for three years. "It is a dark, dark object," the museum's director, Reverend Darius Ras, told CNN. "But it is important for the historical memory of events in the life of John Paul II." Would-be assassin Mehmet Ali Agca used the firearm to shoot the then-Pope in the abdomen, arm and hand, as he was driven through St Peter's Square, Rome on May 13, 1981. WASHINGTON (CNS) -- The U.S. bishops' March 19 designation of a center in Washington as the St. John Paul II National Shrine reflects U.S. Catholics' love for the late pope, said Archbishop Joseph E. Kurtz of Louisville, Ky. As president of the U.S. Conference of Catholic Bishops, he signed the decree declaring the designation for the site of the former John Paul II Cultural Center. It takes effect April 27, the day Pope Francis will canonize Blessed John Paul II and Blessed John XXIII. Liturgical celebrations, a reception and a gathering of young people will mark the occasion. "This national shrine is truly America's fitting tribute and remembrance of his legacy," Archbishop Kurtz said in a statement. The center, which first opened in 2001 as a cultural center, named for the pope, with a research component, museum and gallery, sits on 12 acres in Washington's northeast quadrant just steps from the Basilica of the National Shrine of the Immaculate Conception and The Catholic University of America. TRES RIOS, Costa Rica—On a warm spring day, Floribeth Mora was in her bed waiting to die from a seemingly inoperable brain aneurysm when her gaze fell upon a photograph of Pope John Paul II in a newspaper. Mora, her doctors and the Catholic Church say her aneurysm disappeared that day in a miracle that cleared the way for the late pope to be declared a saint on April 27 in a ceremony at the Vatican where Mora will be a guest of honor. For Mora, the church-certified miracle was only the start of her metamorphosis from an ill and desperate woman into an adored symbol of faith for thousands of Costa Ricans and Catholics around the world. ROME – Priests rubbed shoulders with celebs in designer clothes Tuesday night at the premiere of a musical based on the life of soon-to-be saint Pope John Paul II. Italian VIPs barely managed to cut through the excited crowd as paparazzi flashbulbs fired. Inside the theater, people thronged the souvenir shop for coffee mugs bearing the iconic image of the late pontiff. 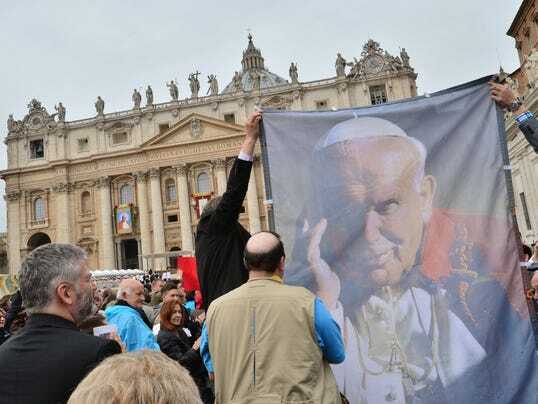 With Pope John Paul II set to be canonized as a saint on April 27, Pope-mania is in full swing in Rome – “Karol Wojtyla, the Opera Musical,” is just one of three musicals dedicated to the Catholic leader. “We gave him the opportunity to get back on a theater stage,” Patrizia Barsotti, one of the show’s writers, told NBC News. The Polish-born Karol Wojtyla became Pope John Paul II in 1978 and led the Roman Catholic Church until his death in 2005 – the second-longest papacy in history. But in his youth he was an accomplished actor, playwright, poet and even contemplated a career in the theater. (Vatican Radio ) I'm sure you remember John Paul II's invitation to us not to be afraid . Certainly he himself was not afraid to stand up to the trials of life in defense of others, neither as Pope nor as priest back in Poland. As you'll discover in a programme presented and produced by Veronica Scarisbrick no one ever doubted the courage of Pope John Paul, certainly not his closest advisors. Among them Nigerian Cardinal Francis Arinze who specifies how .."Pope John Paul II put the Church on the map of the world and in the corridors of those who make policies as perhaps no other pope in our time...you know where he stands on major problems touching church and society...he is not afraid." And certainly not some of those who personally knew him before he was elected Pope back in Poland. Among them a fellow school chum, a student of the future pope's at University, a personal friend and a Polish countess. All of whom recall the courage and moral strength of Karol Wojtyla both as a private and public figure. In a special way when he stood up to the repressive communist regime offering solidarity to those around him. An impression of courage and moral strength reinforced by the Pope's own words which you can hear in this programme, such as when he denounced the injustice of poverty: "...the poor people ..poor in different ways, not only lacking food but also deprived of freedom and other human rights.. ", condemning those: " ...who take these goods away from them amassing to themselves the imperialistic monopoly of economic and political supremacy at the expense of others ..".Or again when he spoke of the importance of solidarity: .." for the disciple of Christ solidarity is a moral duty stemming from the spiritual union of all human beings who share a common origin, a common dignity and a common destiny ..". Sunday’s canonisation of Pope John Paul II will carry a particular resonance in his native Poland – and especially in his hometown of Wadowice. This is where Karol Wojtyla was baptised, where he went to school, where he played in school plays and where he served for a mass as an altar boy every day. The Wojtyla family lived modestly, with their main source of income being the salary of the father, an officer in the military. His mother, who took odd jobs as a tailor, died when he, the future pope, was 9 years old, and his elder brother followed 3 years later. The home in Wadowice where the future pope grew up is now a museum visited by thousands of pilgrims. Refurbished in time for the canonisation, its re-opening earlier this month was attended by dignitaries including Polish Prime Minister Donald Tusk. Many Polish people associate John Paul with inspiring the end of Moscow-imposed Communist rule. “The pope … was a spiritual leader, but also a political leader. There’s no doubt that we ejected the Communists from power thanks to the fact that he mobilised us,” said Leokadia Tylek, visiting Wadowice. Fifty kilometres to the northeast, Krakow is where John Paul served as priest and then archbishop before becoming pope. Once installed in the Vatican, he always made sure to come back to the city during visits to Poland. On the Second Esater Sunday Pope Francis presides over the Holy Mass for the Canonization of the Blessed John XXIII and John Paul II, St. Peter's Square. (Vatican Radio) In 1917 while the rest of the world was at war in a tiny hamlet of the Portuguese countryside three young children had a vision of Our Lady. That apparition on the 13th May sparked off the devotion to Our Lady of Fatima, an inspiration for millions to work and pray for peace. Among them Saint John Paul II who as we know believed it was through her intercession that his life was spared when he was shot at in Saint Peter's Square. The last time he went to Fatima on pilgrimage was on the 13th May 2000 during the Jubilee Year when he entrusted the third millennium to her Immaculate heart. Veronica Scarisbrick witnessed this event which was attended by the last of the shepherd children Lucia, who has since passed away. In this programme you can listen to a recording of her little voice as well as to one of a rather frail voice of John Paul II as he beatifies the other two children Jacinta and Francisco Marto. On this occasion the Polish Pontiff asked his Secretary of State, Cardinal Angelo Sodano to reveal the so called third secret of Fatima.